This Country Snowman is ready to get to work and start sweeping up the Christmas snow from our driveways, not to mention he has his winter scarf on to keep warm! He has a red backdrop with a flannel style cuff and beautiful stitched bordering. Measured This country Christmas stockings measure 21" long along the diagonal from the top of the cuff to the toe; and the width across the cuff is 8". 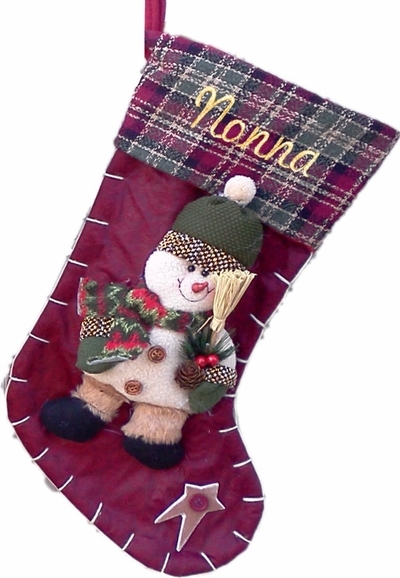 Materials: Fleece, wool, knits, polyester and other materials are put together with attention to detail to make this stocking a real delight. Lining: YES. This stocking is lined on one side with satin and the other felt.